Youngstown State forward Mary Dunn has been named the Horizon League Freshman of the Week for the period ending Dec. 11. It is the second time in the first five weeks of the season that Dunn has earned the award. Dunn averaged 16.5 points while shooting 61.5 percent from the field against Akron and Kent State last week. The Washington, Pa., native scored a career-high 19 points on 9-for-14 shooting against the Zips on Tuesday, and she had 14 points versus the Golden Flashes on Saturday. Her 19 points versus Akron were the most by a YSU freshman post since Heidi Schlegel had 21 at Ohio in 2011. For the year, Dunn leads all Horizon League freshmen in scoring at 11.4 points per game. 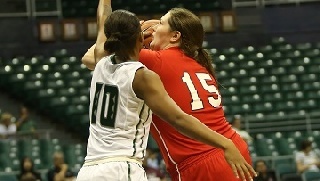 She also tops all freshmen with a .542 field-goal percentage and 1.1 blocks per contest. Youngstown State does not play during the midweek as it focuses on final exams. Its next contest is against Cornell on Saturday at noon at Beeghly Center.